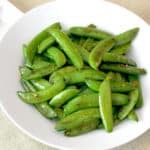 Sugar snap peas with garlic is a simple side-dish that takes 10 minutes to prepare. 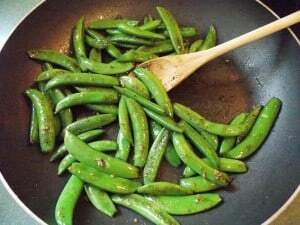 Sugar snap peas with garlic is a simple side-dish recipe that can be made in 10 minutes. Sugar snap peas have a natural sweetness that shines through in this recipe. They are best when they still have a nice crunch. So, they really don’t need to be cooked for very long. To make these sugar snap peas, start by preheating some canola oil in a skillet over medium-high heat. Add the pea pods, salt, and pepper and sauté for 5-6 minutes. Add some minced garlic and sauté for another minute. Remove the skillet from the heat so that the garlic doesn’t burn. That’s all there is to it. Some of the pea pods will have a little bit of browning on the edges, but they should still be a nice bright green. 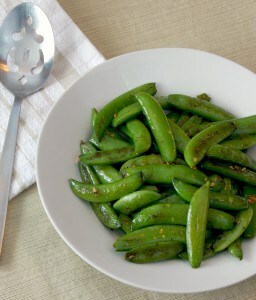 Sugar snap peas with garlic is a simple side-dish that takes 10 minutes to prepare. By not over-cooking the pea pods, they retain their crunch and flavor. Trim the stems from the pea pods. Preheat the oil in a large skillet over medium-high heat for 2 minutes. 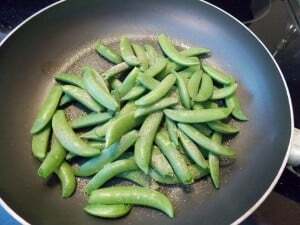 Add the pea pods, salt, and pepper to the skillet. Stir to combine. Cook for 5-6 minutes, stirring occasionally. Reduce the heat to low. Stir in the garlic. Cook for 1-2 minutes stirring often. Remove from heat. I saw sugar snap with lemon. Does this one tastes different?